My whole life I imagined what it would be like to swim with dolphins in the deep blue sea, free from restriction, interacting with them, hearing their sonar language, witnessing their behaviors, feeling their connection eye to eye and taking part in their lives for a brief moment in time. 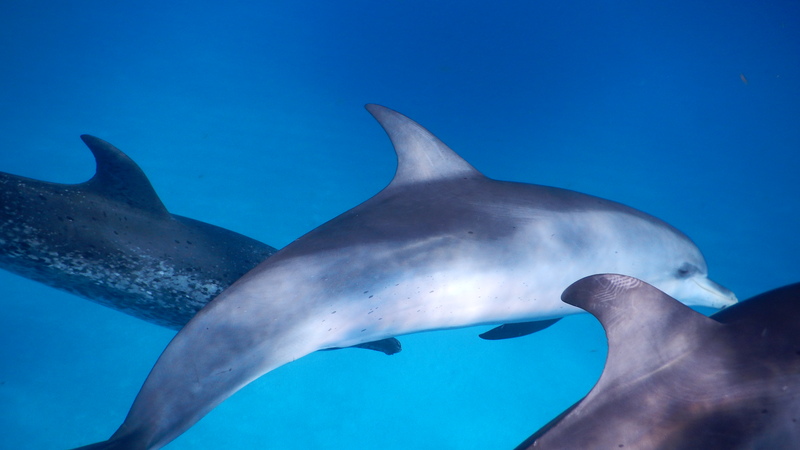 Nothing can describe the peace and thrill of swimming with dolphins, especially when they connect with you while swimming — looking you in the eye and giving downloads of pure acceptance. It felt like something I already knew, just ten times more profound and real. God like. The moments were insightful and deep. 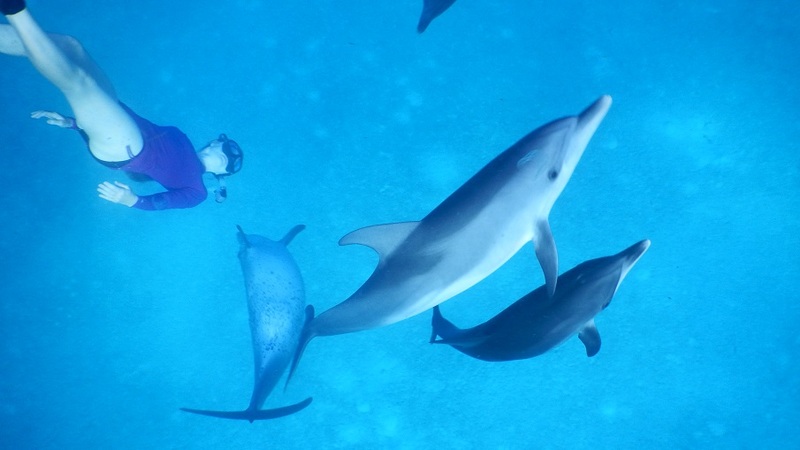 My recent trip to the Bahamas came when my dear friend and fellow traveling Soul, Wendy invited me to share in her sacred journey to swim with the Dolphins. 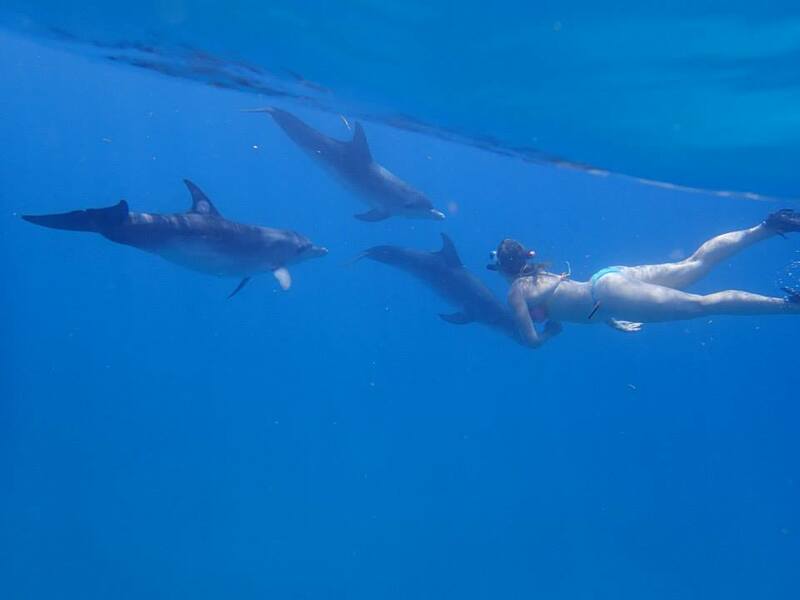 Through her local connections we arranged for private lodging and a 5-day guided trip with a woman who has been swimming with dolphins for years. This woman, Kathleen, we named the “Dolphin Dancer” because she free dives down to more than 35 feet and the Dolphins swim all around her in what seems like an intimate choreographed dance. Each morning we rose to catch the sun rising over the ocean and set our intentions on calling in the dolphins to join us for the day. I would meditate, practice Qi Gong and then go out after sunrise on a long walk exploring the island while connecting with beautiful friendly people and taking in the exquisite nature as the community came alive. After lunch we would set out in a power boat in search of the dolphins. On my first day, just after taking pictures of the sunrise on my Iphone, I noticed a shot that made the shadows of the clouds appear as though a lady was swimming directly under three Dolphins. I knew that was a sign that our first day would be more than spectacular! 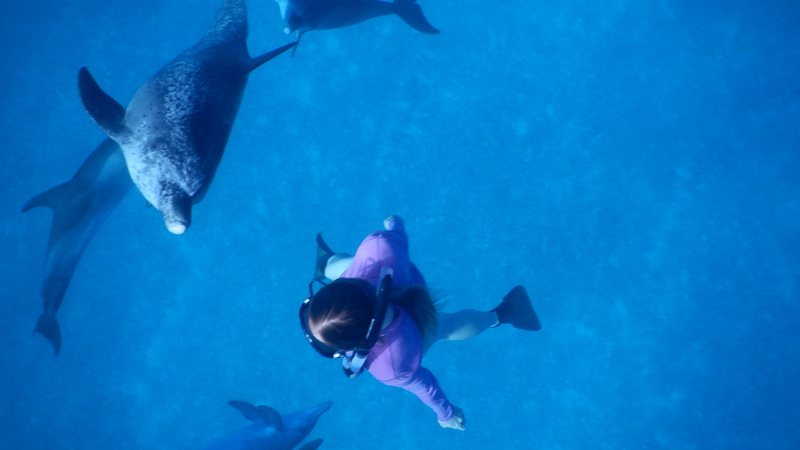 Since it was my first time being guided to swim with the dolphins out in the wild, Kathleen took the time with me to explain the best way of going on such a journey. She suggested that I keep my mind open for whatever might come. We were traveling into the dolphin’s home, and it wasn’t up to us to decide if one, they would be out and about near us or two, they would even want to swim with us. She explained how each trip she had been on was special in itself and that each person would get what they needed from the experience. She told me how to keep my body stream lined and free from unwanted sudden noise as this could scare the dolphins. She went so far as to describe how to enter the water from the boat as well as what to do if and when a dolphin came swimming directly toward me. That first day, we traveled to the other side of the island to meet our captains and embark on our adventure of searching for any pod of dolphins. While on the power boat, a few of us sat on the bow keeping an eye out for movement atop the surface of the water. Within fifteen minutes, we saw them. Some fins near ten/eleven o’clock and some further out around two from the position of the bow of the boat. We put on our snorkel gear and as we approached the pod, Kathleen confirmed we were going to be in the presence of spotted dolphins. This was great news for us as the spotted dolphins seem to be more friendlier and willing to swim with people, more so than the bottle-nose. Wendy and I were so ecstatic, we just about held our breath waiting for the captain to signal to Kathleen it was time to slip into the water. As she slipped in, we followed and as soon as we were in, the dolphins headed right towards us. Just like that. Kathleen immediately swam straight down and within moments, the dolphins swam all around her as though she was part of their pod and they had been waiting for her. I watched atop the water in amazement at what was happening before my eyes, I almost had to pinch myself because I couldn’t move at all. More than a year prior, while in Kauai I swam out to a pod of spinner dolphins for what seemed like a mile or more from shore (according to my friend who watched in disbelief as I swam out alone). I was so close to the dolphins but all that happened was me swimming far out and then getting about 15ft away from them just to watch them swim away. I was so disappointed at the time, I swam back to shore in panic (because that’s when I realized I was a little fish in a BIG ocean all alone). I wondered why the dolphins didn’t want to swim with me and later learned that there are many types of dolphins and if they sense you are “trying hard” to get near them, they will swim away. If they notice you playing and having fun on your own, they will more than likely want to take a peak and possibly join in with you too. I learned two lessons in Kauai that day: NEVER ever swim out in the ocean, far from shore alone and NEVER try to swim towards dolphins as they are swimming further and further from shore. They are faster swimmers and will always be ahead of you in the game of swim chase. Let them come to you. If it’s meant to be, it will be. So, after witnessing a spectacular dance of human and dolphins before my eyes, I realized these dolphins might actually be up for playing with more than one human so I took a chance and dove about 5-10ft down to see if they would come my way. After two hours of swimming and playing with the dolphins, finally, three from the same pod swam up to me and locked my gaze as they swam all the way around me really slowly. There were two bigger ones with white spotted noses and another young one who we later learned was called “Tilly”. She had what appeared to be an old shark bite wound on the top of her dorsal fin. Tilly and her crew swam with me for what seemed like ten minutes or so. In ocean time, that’s a very long time. No words can describe the energy one feels in knowing these highly conscious beings are connecting on such a level. After the dolphins were done swimming with me, I felt as though these beautiful creatures knew me even more than I knew myself. From that one experience I knew that nothing else mattered. The dolphins had sonar-ed me and I felt them leaving imprints on me that would last a lifetime. All I felt was peace. Talk about an experience of a lifetime! After a wonderful day with these creatures, our captain said that the bar was set very high and that the wonder we experienced really wasn’t a common occurrence. After five full days of this exquisite sacred experience, I sat in gratitude looking forward to sharing my experience with other free spirits in search of travel that leads to a reflection of the soul. What does this mean to those of you who yearn to travel and swim with the dolphins and perhaps experience them the way we did? There is more to this story and we have a dolphin experiential package we will be offering for this January. For now, for the gift of this adventure I want to thank Wendy; she is a true friend with a generous kind heart. I also send thanks to Kathleen for guiding us and sharing her dolphin knowledge from a place deep within, in a way that helps to bridge the gap between dolphins and human reality. Most importantly, gratitude to Tilly (dolphin) and her pod for all their daily interactions and generous healings, and to the universe for aligning everything so divinely for all of us.